Looking for movie tickets? Enter your location to see which movie theaters are playing Snowmen near you. 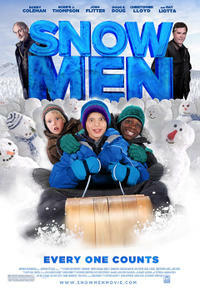 Parents need to know that Snowmen is a 2011 coming-of-age movie about a boy with terminal cancer who rallies his school and community to try to set the Guinness World Record for the most number of snowmen made in 24 hours. There are scenes showing frequent bullying, as the bully pushes, shoves, and name-calls his way through each of his scenes, but it's worth mentioning that the lead character develops a strong sense of empathy during the movie and begins to understand that the bully is a bully because he has no real friends and doesn't know how else to behave. There are instances of inappropriate humor: Two boys who become friends start a snowball fight culminating in one tackling the other, holding him down, and forcing snot bubbles out of his nose until they almost drip in the other boy's face. Friends are nearly buried to death under snow by a bulldozer; this same bulldozer uncovers the body of a deceased elderly man who stares these boys directly in the face. However, in spite of these moments of bullying, violence, and inappropriate humor, this movie does teach lessons on the importance of empathy, honesty, and overcoming obstacles to achieve one's dreams.